In our work with athletes at Peak Performance Sports we teach mental training strategies to soccer players, coaches, or teams. However, an important support group to players is often left out of mental game training — sports parents! Parents play a very important role in the development of a positive and strong mental game for soccer players. Parents who are knowledgeable about “mental game” strategies can better support their athlete’s development and confidence. For example, without a better understanding of the mental game of soccer, parents are at risk of placing high expectations on their athletes that can be perceived as extra pressure for athletes. This is often detrimental to success. Parents can, without even knowing it, interfere with or hold back the mental game development of an athlete. As a soccer parent, even though you have the best intentions and are trying to be helpful, you might be undermining your athlete’s confidence. From our experience, we find that parents’ expectations for athlete’s can be perceived as pressure. As a parent, it is easy to impose your own high expectations for success on your athlete. Your intention is likely to boost your children’s confidence, though many times, the opposite occurs when these become expectations for athletes. 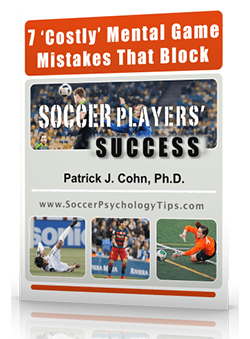 At SoccerPsychologyTips.com, we will help both parents and athletes understand the effects of high or strict expectations on athletes and how this may limit performance. 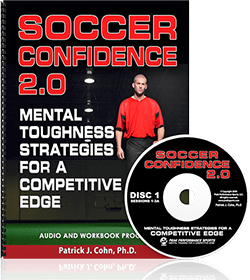 Confidence is key for soccer players to feel relaxed, play with intensity, and perform consistently. In comparison, expectations leave soccer athletes feeling frustrated when they are not performing up to their self-imposed ideals. Having high confidence, void of judgmental expectations, is imperative for success. When working with parents, we teach them the difference between confidence and expectations. We help them identify expectations that hurt their soccer athlete’s success — and sometimes hinder their confidence. Even though you’re trying to be helpful and boost kids’ confidence, you might be saying things to your soccer athlete that can be interpreted as an expectation. This may sound like a positive thing to say to give your soccer player confidence, right? However, we have a different take on this. Your soccer athlete may take these kinds of statements in a way you didn’t intend. Often times, your athlete will feel pressure to score two goals, meet your expectation, and avoid letting you down. For some parents, this may be an adjustment and may be different from what you have been taught about positive expectations. By removing these expectations your athlete will be able to focus fully on each play, rather than the end result (scoring two goals). 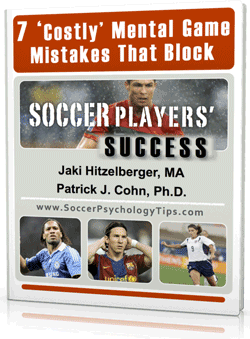 We offer here just one example of how soccer parents need to understand soccer psychology. There are many other ways you can help your athlete succeed with a positive mental game.